The Enforcer starter incorporates everything known about High-performance racing starters. 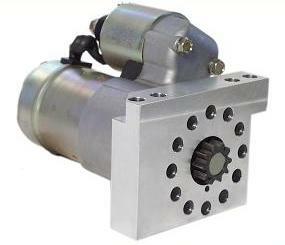 The HITACHI Enforcer starter has 6:1 gear reduction with a permanent magnet-coaxial design, nothing out there tops it. The HITACHI PSL100 Enforcer starter weighs 7½ pounds, making them the one of lightest starters available. 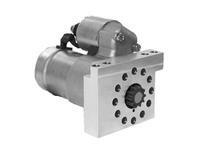 Another key leading feature of the HITACHI Enforcer starter is 360° multi-clocking on the mounting block. The PSL100 (Chevy V8 Small Block) includes ARP High tensile bolts. Chevy- V8 S/B Block, V6 AT & MT with 153 or 168 tooth ring gear.